September brought my first trip up to Grand Marais, Minnesota, to participate in Plein Air Grand Marais. I'd heard about this gathering for years, and this year brought an unexpected opportunity to join in. I spent the morning exploring Cascade River State Park. 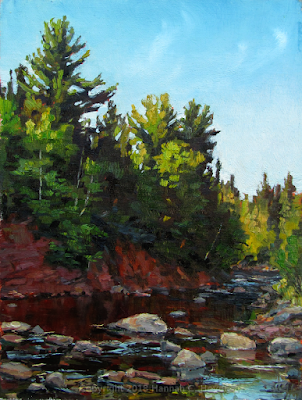 The sunshine was warm, and I was not prepared for how cool the wind would be later on when I returned to paint, stepping across the stones in the river to set up my easel on a little island midstream. September 9, 2018: More exploring, this time mostly from the car. 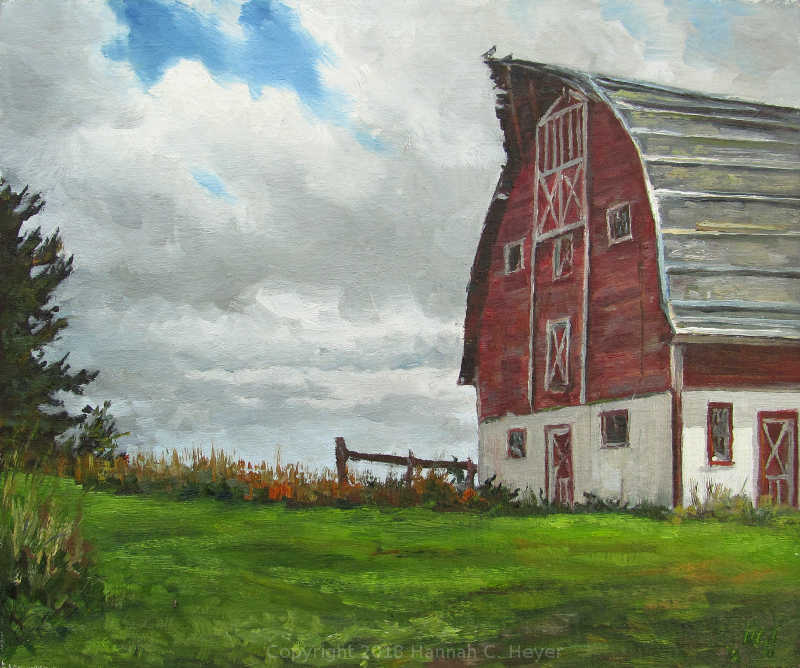 I passed this barn a couple of times before deciding to stop and ask if I could paint it. The barn, about 100 years old, was awaiting a new roof. A couple of pigeons flew over my head, returning to the peak of the roof where they were clearly at home. September 10, 2018: The sun peeked out every now and then, but the clouds took the day. I spent more time exploring, driving and stopping anywhere that looked interesting. I walked some ski trails until I remembered the existence of bears and scared myself. I ended up at Sugarloaf Cove and painted on the rocks. The light and color of the water changed quickly as the rain passed by in the distance. After nightfall, I joined artist Naomi Tiry-Salgado to paint in downtown Grand Marais. Despite the wet weather there were other painters out around town, too. 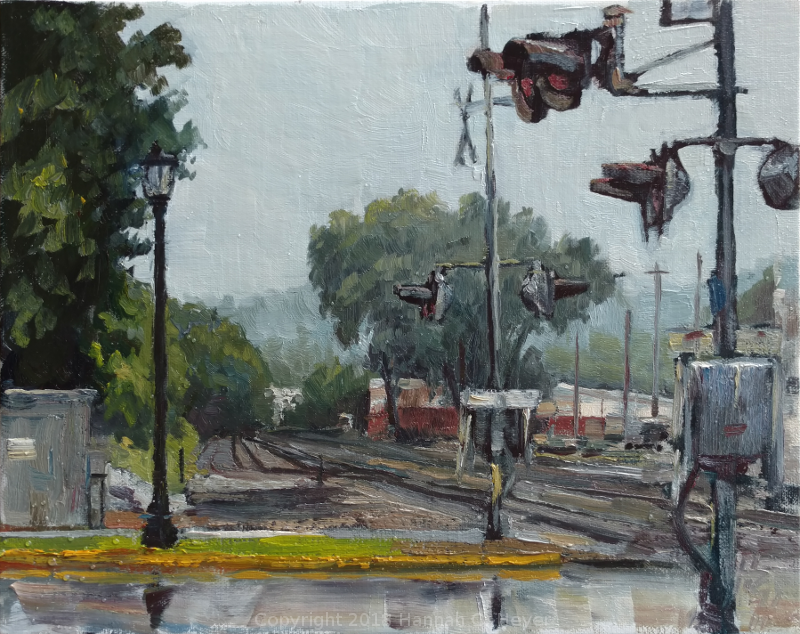 I set up in a doorway to partially shelter my easel from the rain, accompanied by an umbrella and hot tea, across from the "World's Best Donuts" (unfortunately closed at night!) The wet street made for some great reflections, and a street light glared off the back of a stop sign. The tall white building was once the Light Keeper's house, built in 1896, and is now a museum. 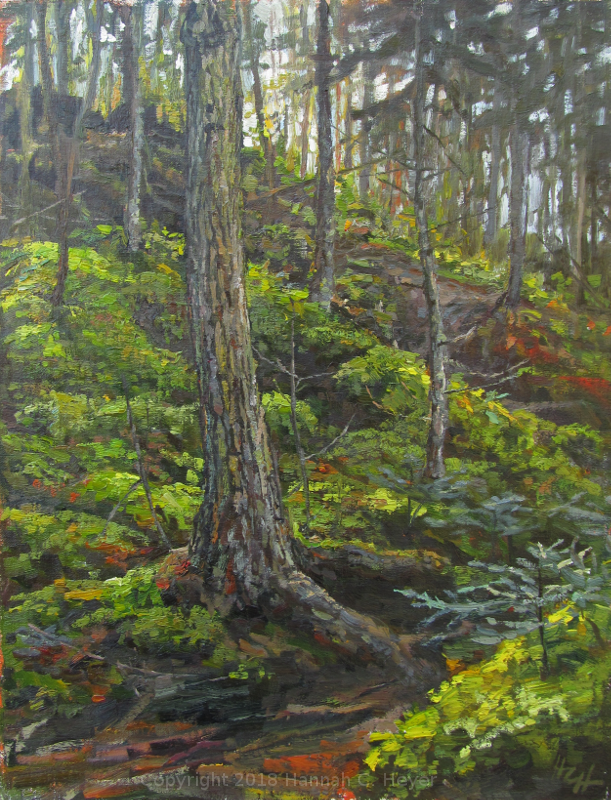 I returned a couple of nights later to tighten up a few things on the painting before calling it finished. September 11, 2018: Back at Cascade River State Park, at a place I'd found while hiking around on the first day. It's a beautiful spot, with deep shade, thick moss, and rich color; but the painting was a fight. I returned the next day to work on it again, and in the end I brought it home with me. There are lessons in this one, I think, but it may take some time to really learn them. 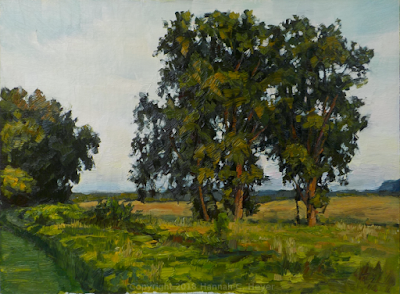 12 x 9" plein air oil on linen/birch. Later I painting along Highway 61, a few miles outside of Grand Marais. 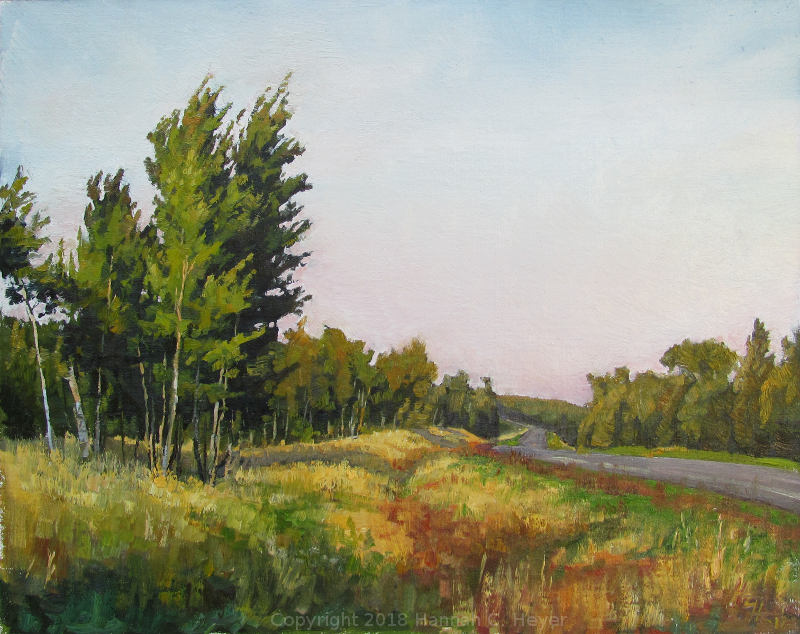 I was taken with how the evening sunshine brought out the shapes of the trees and all the roadside color. September on 61, 11 x 14" plein air oil on linen/birch. 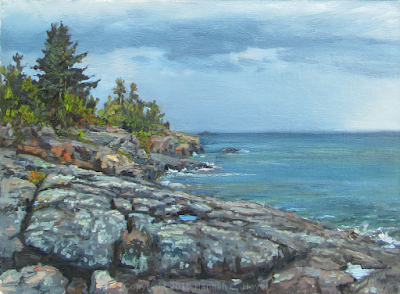 Thursday, September 13, was the 2 hour quick paint event in Grand Marais. It was the last painting I'd be doing, and the last part of Plein Air Grand Marais I'd be participating in. 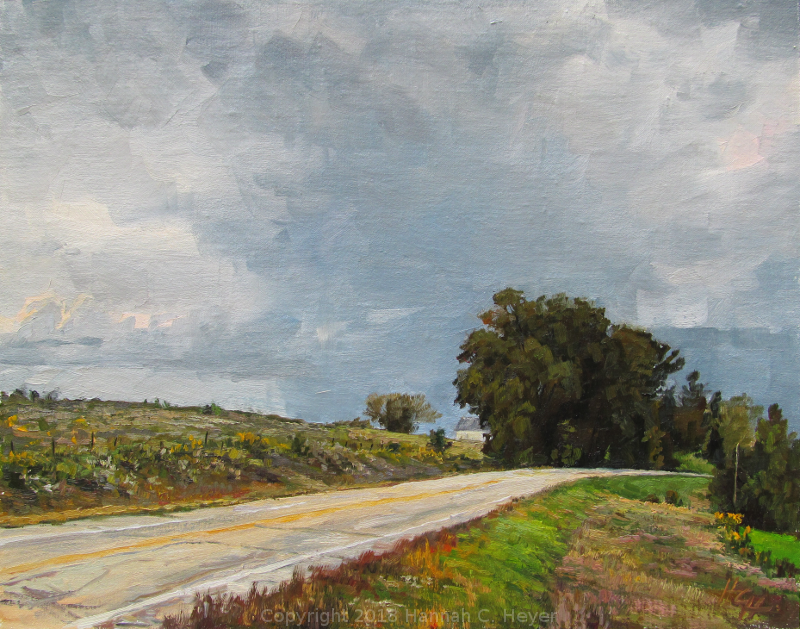 I was running around like a chicken with its head cut off, framing and dropping off paintings and thinking about all that I needed to do before and after my long drive home. I was late to set up painting, but at that point I didn't really mind. This was the icing on the cake; I wanted to give it my best but also just enjoy it. It was time to be still, to be quiet, to learn and to rejoice. After the fight of my other woods painting I almost didn't attempt this one. But there was just something about these backlit boulders, their edges and moss-covered angles, that caught my eye and held it. Beautiful. A quick dinner with friends and then it was time to hit the road. 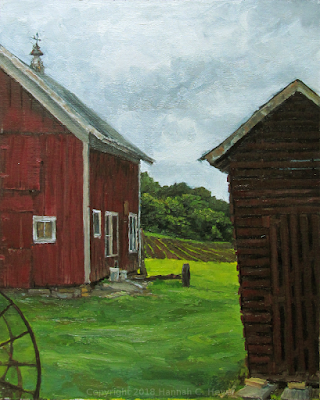 I left grateful for the opportunity I had to participate in this event, time spent with acquaintances new and old, all the people from Outdoor Painters of Minnesota who were involved and worked so hard to pull it all together, as well as those from the Johnson Heritage Post Art Gallery, which held the show from the 14th through October 7th. I didn't get to be there for the opening, but I got a wonderful surprise when I heard that "The Light-Keeper's Place" had received the 1st place award for the Night Paint category! A big thanks to judge Jeffrey T. Larson. 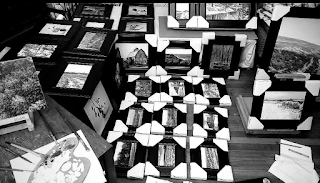 Friday found me home again packing up for the Driftless Area Art Festival, which took place on Saturday and Sunday. Severe damage from recent flooding caused the festival to be moved from its usual location to the fairgrounds in Gays Mills, Wisconsin. The volunteers did such a great job in organizing this last minute change! For me, this is always a special event, in the middle of a special part of the Midwest. 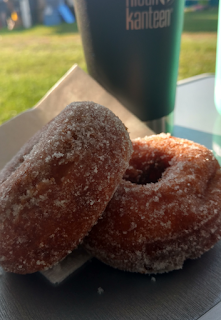 Apple cider doughnuts :) They treat us well! 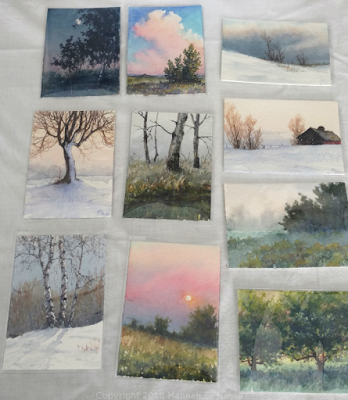 Tiny watercolors - 2.5 x 3.5" each. The weekend was unusually warm for September, but I think we were all glad for the sunshine and lack of rain. A huge thank-you to everyone who showed up and made it memorable, interesting, and so enjoyable. 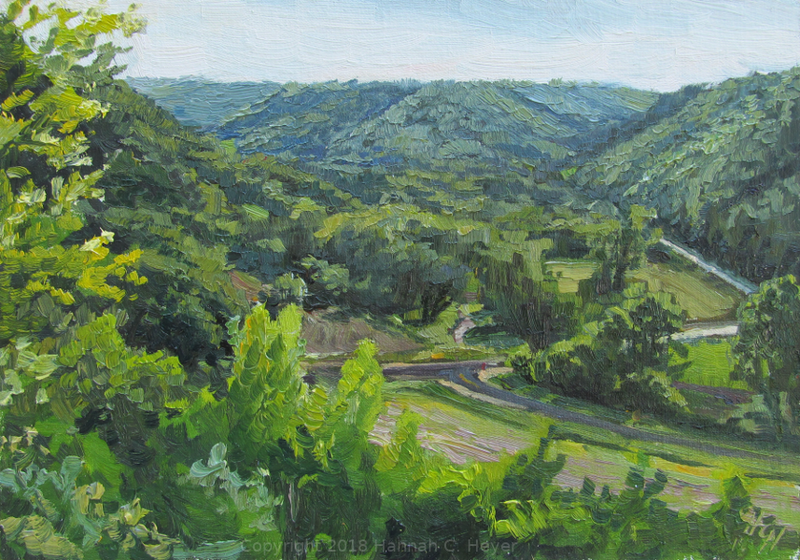 The sixth annual Plein Air Between the Bluffs outdoor painting event had begun on the 7th in La Crosse, Wisconsin, and I was glad to get a few days to join in. As I set up to paint, the afternoon's sunshine gave way to storm clouds. 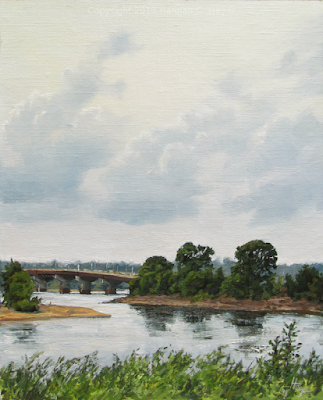 I'd nearly finished painting when the wind whipped up and it was time to bail. 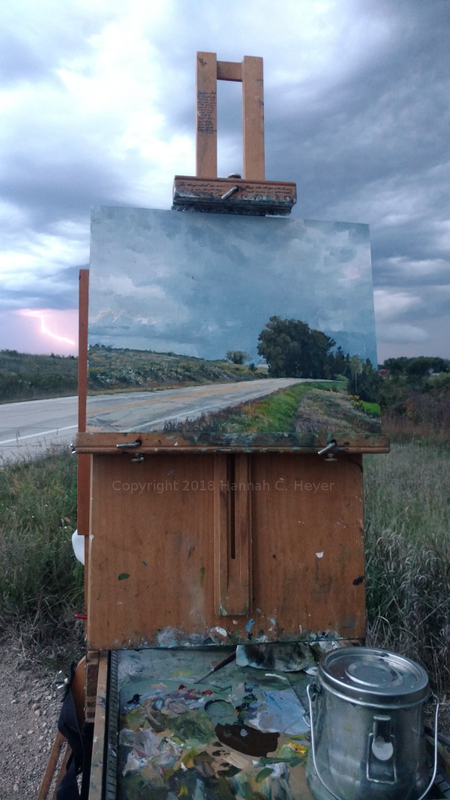 I was able to return a while later, between the first storm ending and the second beginning, to put the final touches on the piece and watch the distant lightning. Tuesday, September 18th, in Dresbach, Minnesota down by the Mississippi River. It was a mostly grey day, but a little bit of blue sky showed above the river and soft light shone on the trees in the late afternoon. 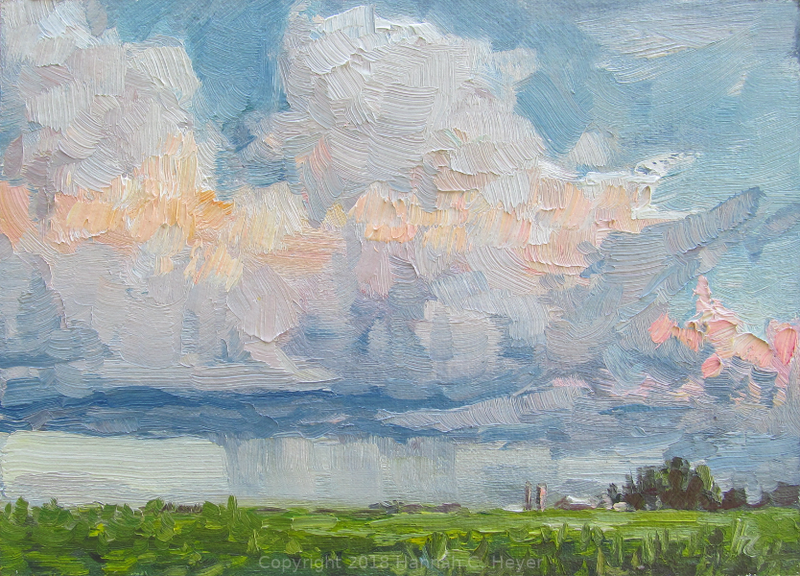 Cloud Reflections, 9 x 12" plein air oil on linen/birch. Wednesday, September 19th. 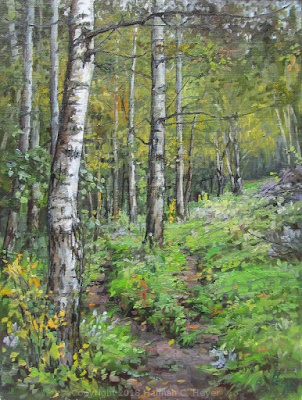 A soft rain fell in the woods below the orchard on the farm, where the cow paths converge and split as they wend their way through the aspen trees. The greens of summer were beginning to give way to the coming colors of fall. A little damp, but happy. 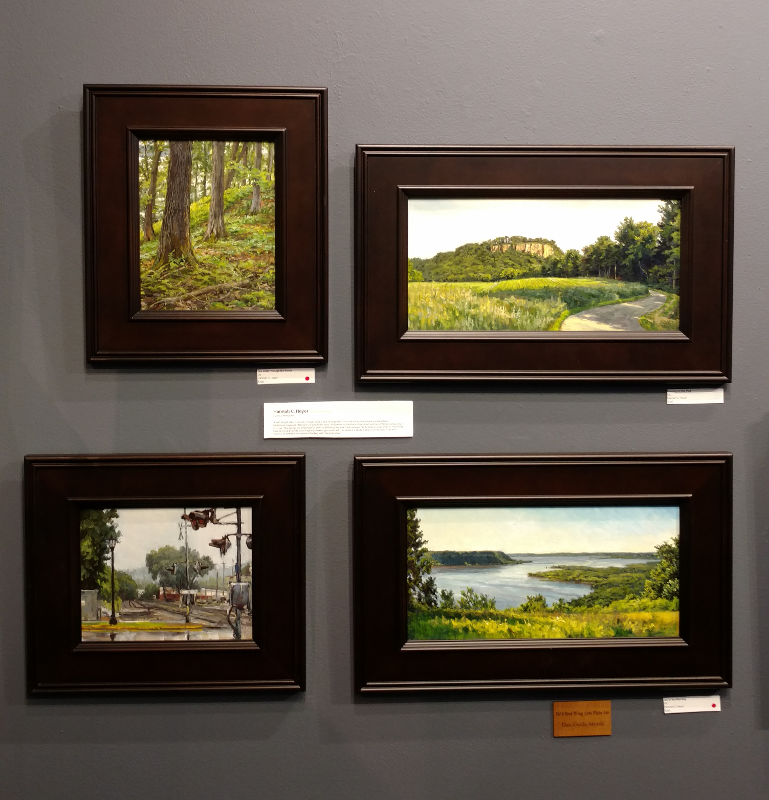 The public opening for the show was held at the SG1311 gallery in La Crosse. 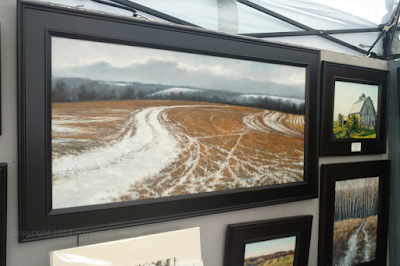 It was great to get to see all the new work, and talk with the other artists and people who came to the show. Beth Bathe, who judged the show this year, gave a talk, and the gallery dog made his way around the room, hoping for a dropped hors d'oeuvre. 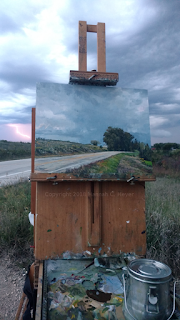 I was very happy to receive a Merit Award for my "Quiet Thunder" painting, and even happier that two pieces found new homes. P.S. Pasture Studies: closing out the month with some quiet painting on the farm. 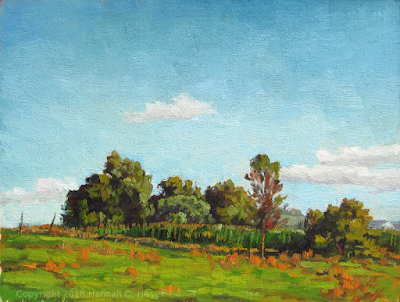 September 26: 6 x 8" plein air oil on linen/birch. 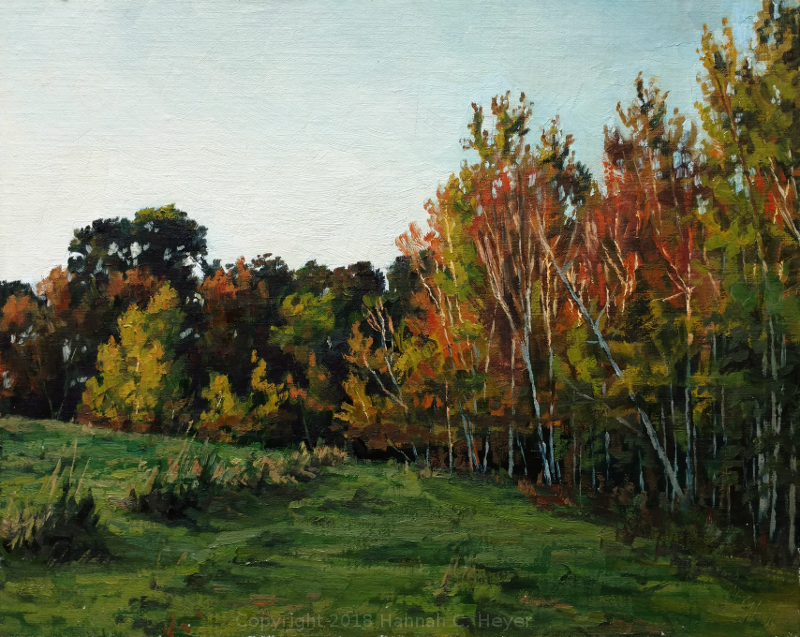 September 26, 28, 11 x 14" plein air oil on linen/birch. 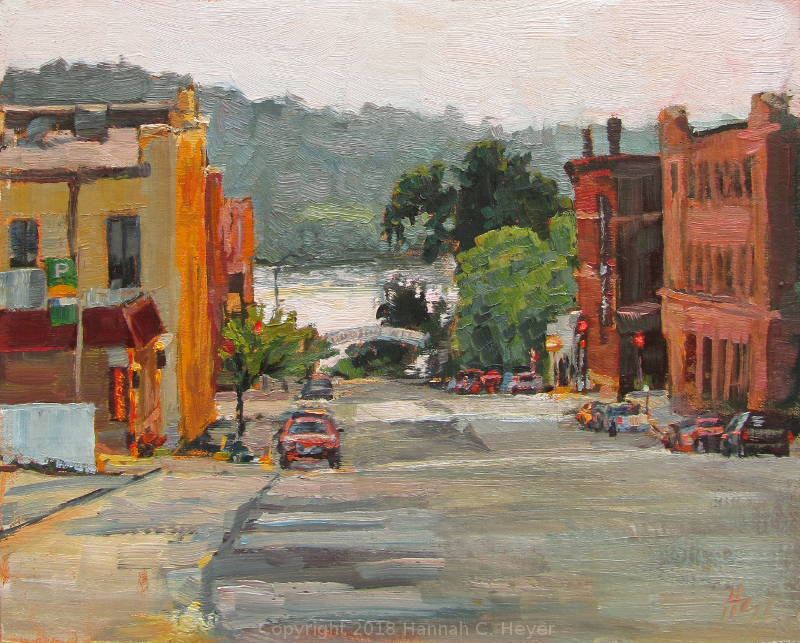 Mid-August brought me to Hudson, Wisconsin for the 3-day Plein Air Hudson outdoor painting event. It was a weekend of cloudy skies and hazy sunshine. My first painting was in an alley off of Walnut Street. 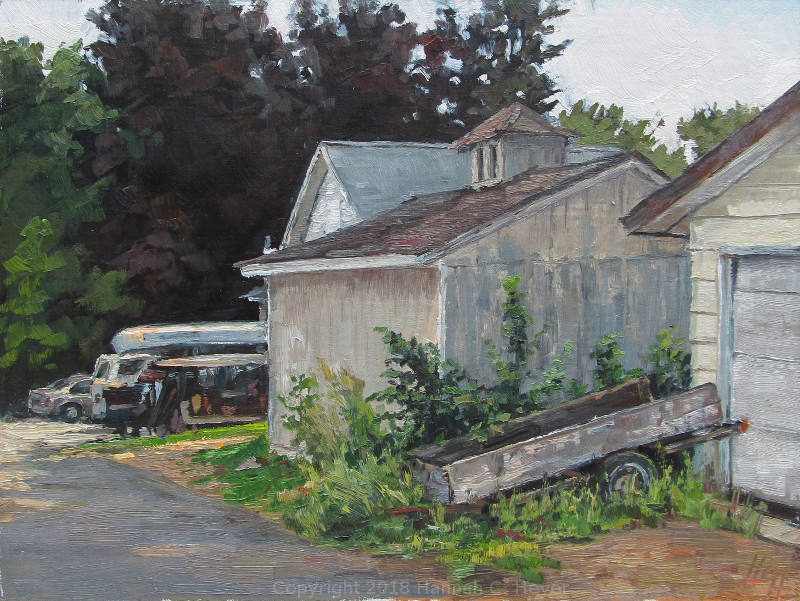 I was drawn to the shapes and lines of the buildings in the alley and the subtleties of color found there - the grays of the street and the weathered shed, surrounded by summer greenery with the darker trees in the background. Alleyway Gray, 9 x 12" plein air oil on linen/birch. Later, I met up with a couple of artist friends who were painting the falls in Willow River State Park. I stayed long after they had finished up, working on my own interpretation of this place of rock and water. 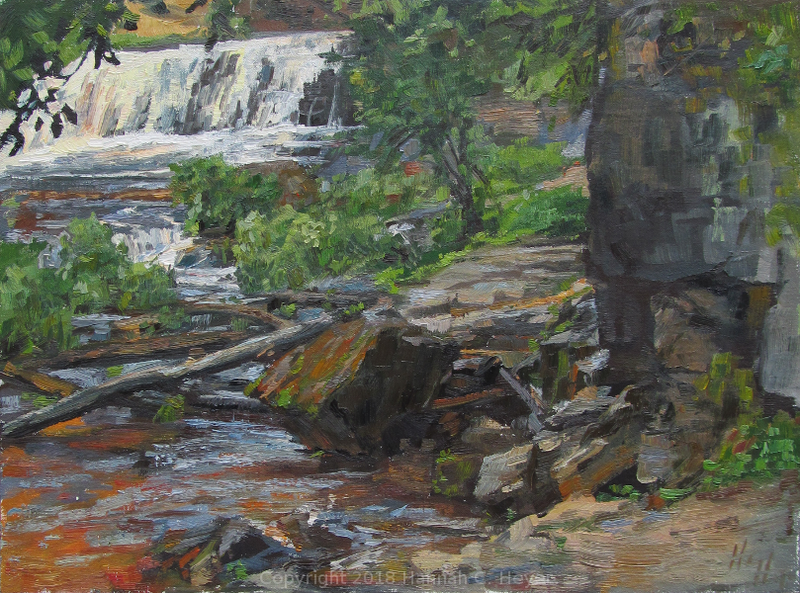 It is a popular spot in summer, though I didn't incorporate any figures into my piece. Painting number 3: I wrestled with roof angles, loving the grasses and vines surrounding these outbuildings on a farm in Houlton. (Thank you to the folks who live here and were so gracious to the invading artists who painted on and around the farm that day!) 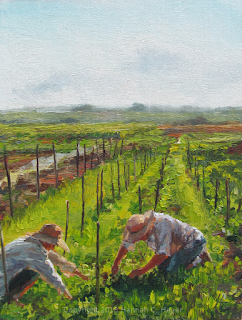 This piece received an honorable mention from judge Joshua Cunningham at the opening. Farm King, 11 x 14" plein air oil on linen/birch. I began this painting as dusk fell and the sun disappeared in the haze across the river. Lights began to glow in the dim; my eyes were drawn down the street past the facades of the buildings to the trees of the park. 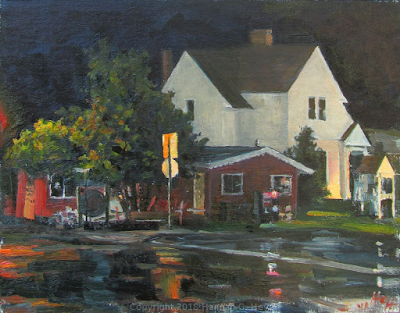 The light failed before I was satisfied, and I returned the next night to finish up a few things - like making the parked cars look a little more like cars and less like a large caterpillar sitting by the curb! I enjoyed this one. A little study of the trees along a quiet spot near where the Willow and St. Croix rivers meet. 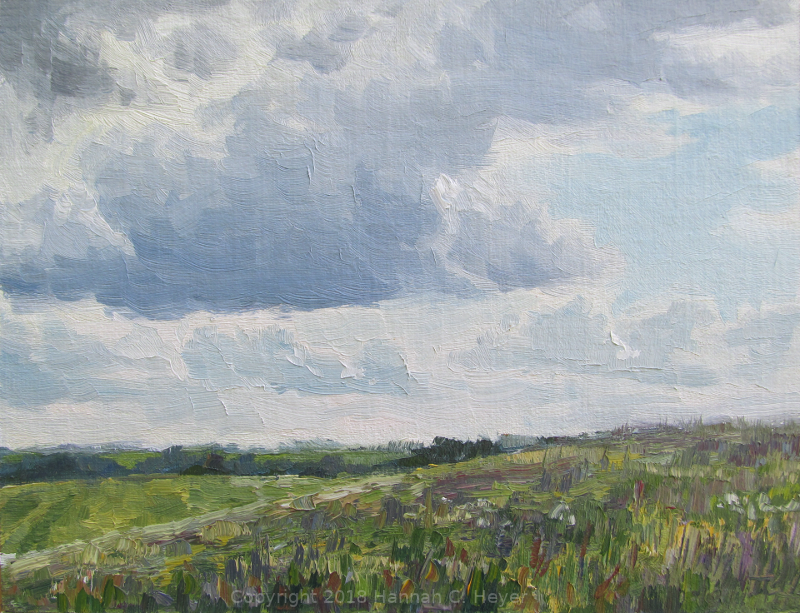 8 x 10" plein air oil on linen/birch. Later in the afternoon the sky clouded over again. 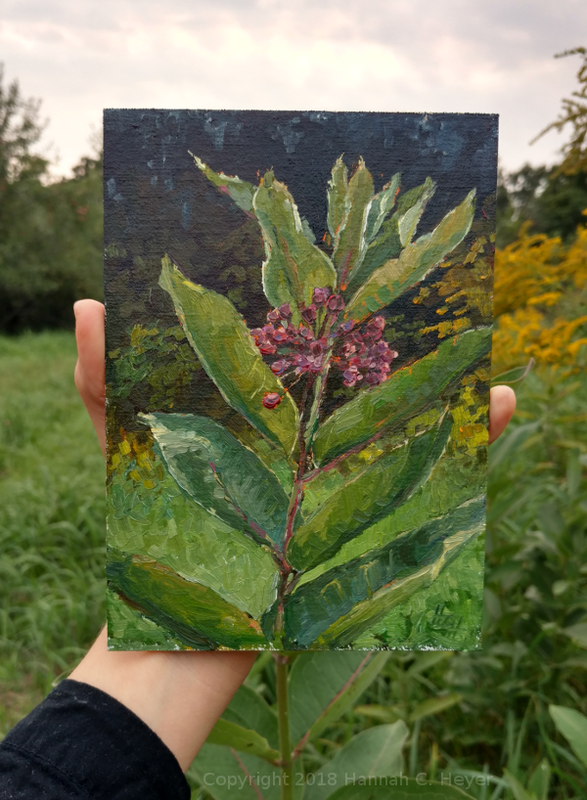 I painted near a friend, and it was nice to have another set of eyes every once in awhile to give feedback and help work out problems in the painting. The clouds held my attention as they drifted above the dark trees along the river. 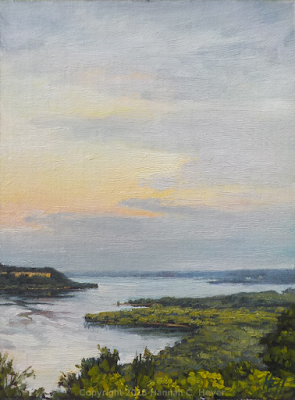 Monday evening held the opening at the Seasons on St. Croix Gallery - they do a great job, and it's a grand time filled with appreciation of art and nature and architecture, and some wonderful and meaningful conversations and connections. And then, how good to be home again. A few days later I did my final paintings for the month of August, out by the orchard, along a field taken over by goldenrod and milkweed. June 1, in the garden. The peas are growing, but the weeds are growing too. June 5: The field road cutting its way through the long grass, the dark brown of a newly planted field, the uppermost row of apple trees in the orchard and the edge of the woods. 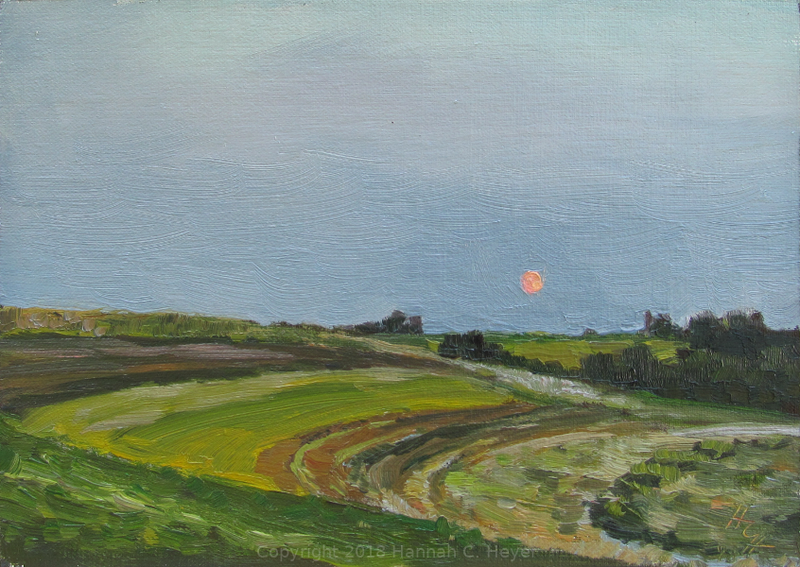 The evening shadows beginning to stretch across the fields as the day neared its end. 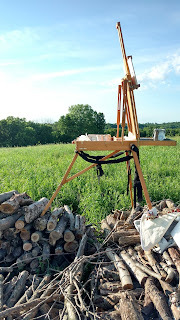 I wanted a little higher perspective for this painting, so I set up my easel on the top of a woodpile. 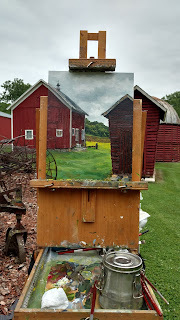 June 10: Hanging out with a painting friend, and warming up for the Red Wing plein air event. The view looking across the valley. So much green! June 23: In the hayfield - timothy hay. Beautiful soft purples amongst the greens of the field. Red-wing Blackbirds and Bobolinks. June 27th, evening. 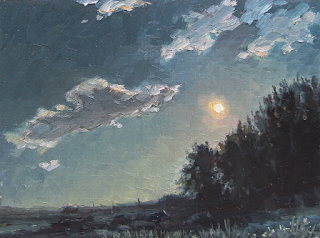 I wanted to paint the moonrise. 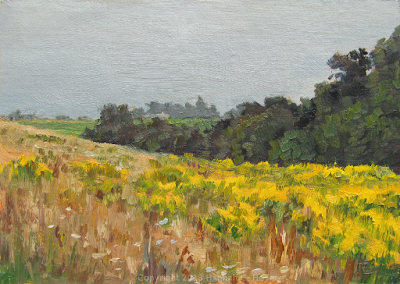 I spent so much time wandering around, up and down hill and through the fields, that I missed the very beginning. 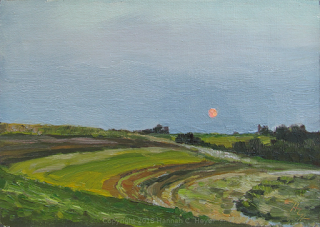 But I set up my easel at the farm across the road and painted the moon rising over fields and fence-line trees. As the light faded and the fireflies came out I painted another quick study. I love the colors at this time of night! The dogs, who know they're not allowed there, snuck across the road and greeted me with tails wagging - time to quit and take them home again. But it was so lovely out, and the moon was so bright! I got a clip on light from the house and went out again, around 11pm, and began to paint while a few clouds passed over. July 6: A storm passed through and spoiled some of the hay. It was baled and waiting to be picked up off the field. 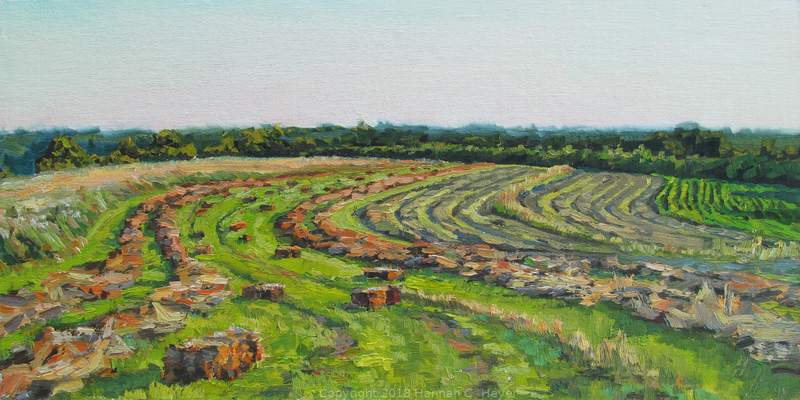 Windrows of cut hay lay out to dry in the summer sun. 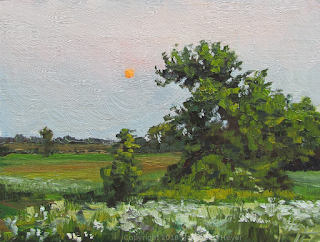 July 9: An evening in the pasture. Gooseberry bushes around a great old oak tree. Shadows lengthen on the hillside, and the cattle, after a rest in the long grass, again slowly made their way across the pasture, continuing their grazing. 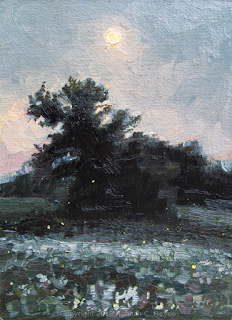 July 10th, evening, another attempt at a nocturne painting. A learning experience for sure! I've a long way to go. July 15th, evening. 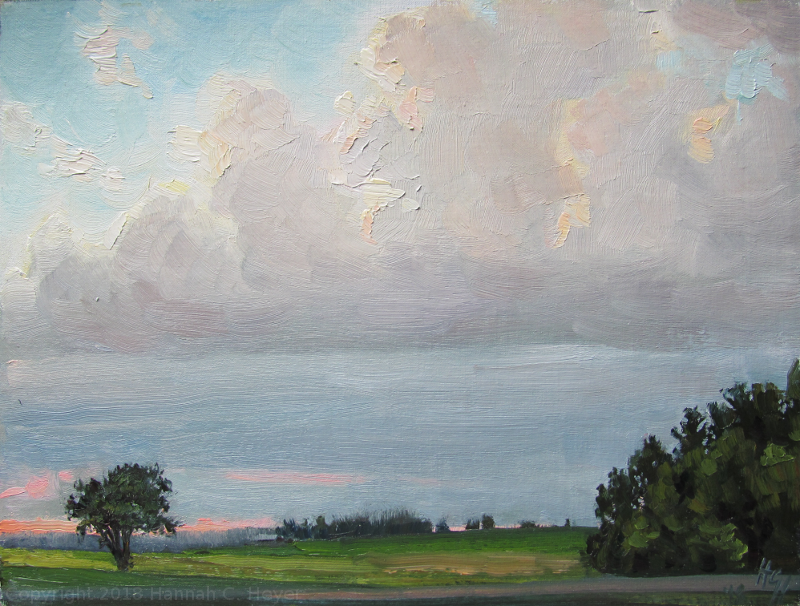 After a long day of indoor work, I escaped outside to paint the sky. Two little cloud studies, one facing south, and the other north. 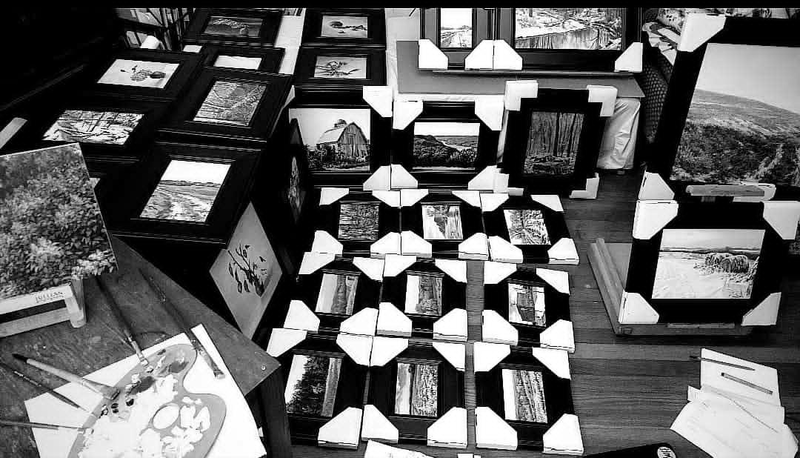 Also in July, I finished up a commission, and did lots and lots of framing in preparation for the Stockholm Art Fair in Stockholm, Wisconsin. It was a beautiful day for the art fair, on the shores of Lake Pepin, and I had a great time. 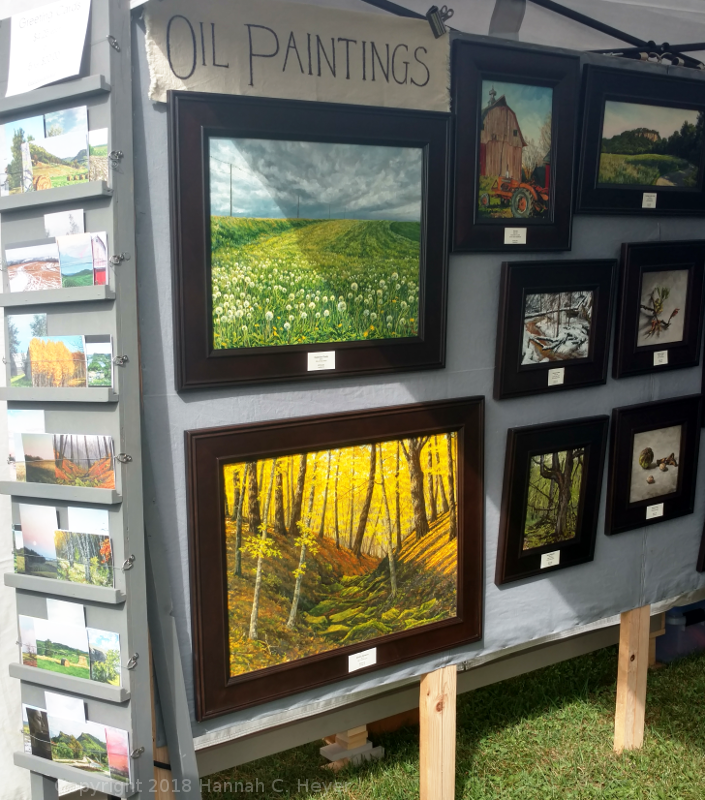 Huge thank-you to everyone who stopped by, and especially those who took home paintings! I'm so grateful. July 25. 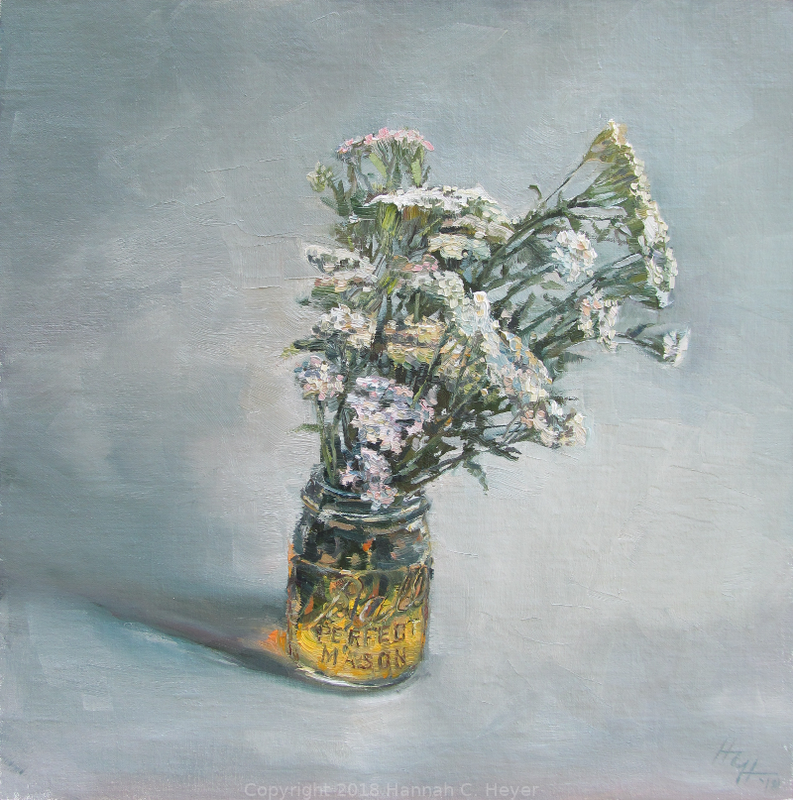 One night I had picked some wild yarrow out of the pastures along the edge of the woods. I had them in a pint canning jar, an old one with very thick glass. The yarrow stems dyed the water yellow. July 27: Another night watching the sky. July 30. My two-year-old niece has been spending the week at the farm. She's so sweet, and so wild, and she never seems to stop moving! Even in her sleep she is not still. 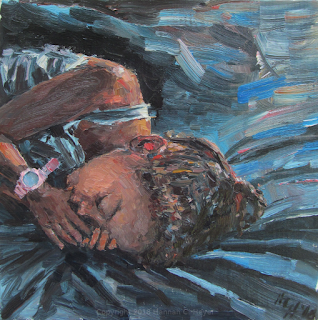 But I tried a quick little study of her in oil paint during her nap one day. July 31. 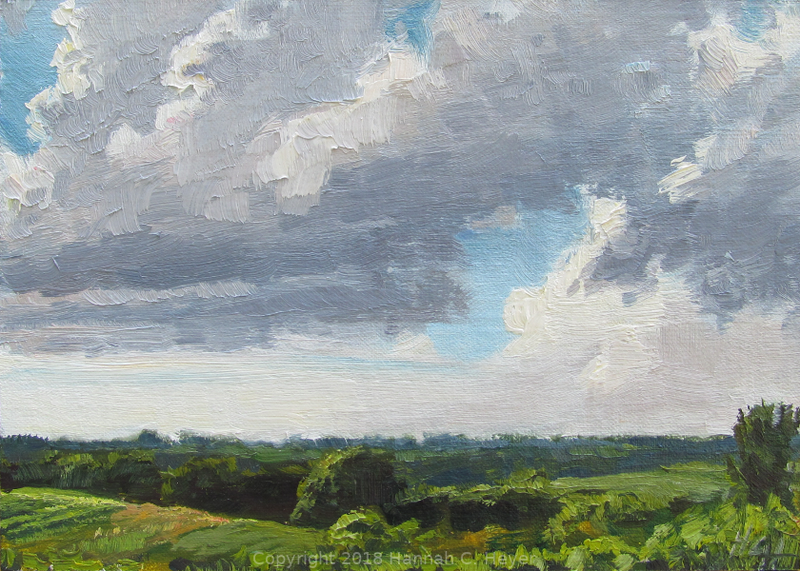 We've had a few days with such beautiful cloud formations and I finally got out to paint some over the garden. I really enjoyed studying them and trying to figure out how to show their form and brightness. The garden was its own challenge with all those greens - from leeks, cucumbers, raspberries, corn - under the hot afternoon sun. The week started out cloudy. I headed for the woods. I had decided to visit Frontenac State Park this year, never having gone before, and I'm so glad I did! I ended up doing half my paintings there. I've only just begun to get acquainted with the place, and will have a lot more exploring to do in the future. Along the Upper Bluff Trail there were a couple of places with large fern beds on the steep hillsides facing the river. 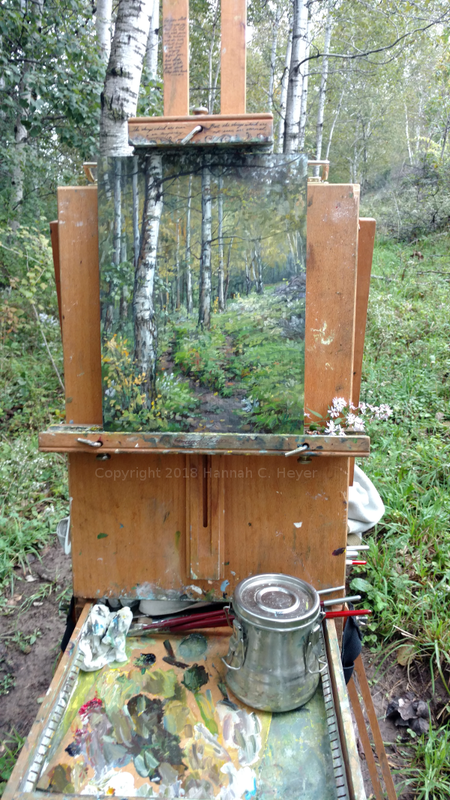 I set up my easel near one of these. Just the right sort of place to spend a few hours quietly, taking in my surroundings, all the colors and sounds and fragrances of the woods, occasionally flicking away a spider or an ant or being scolded by a squirrel. My easel and gear can get pretty heavy, and are always a bit cumbersome. I carry it all on my back and plod along like an overgrown turtle. This week I tried something new and brought a small folding scooter with me to use on paved trails. It got me around a lot faster, and wasn't much to wheel along with me in the places I couldn't ride. I'm still a turtle, but now slightly faster and slightly more ridiculous! The day continued cloudy, but as the sun went down the clouds broke up a bit. 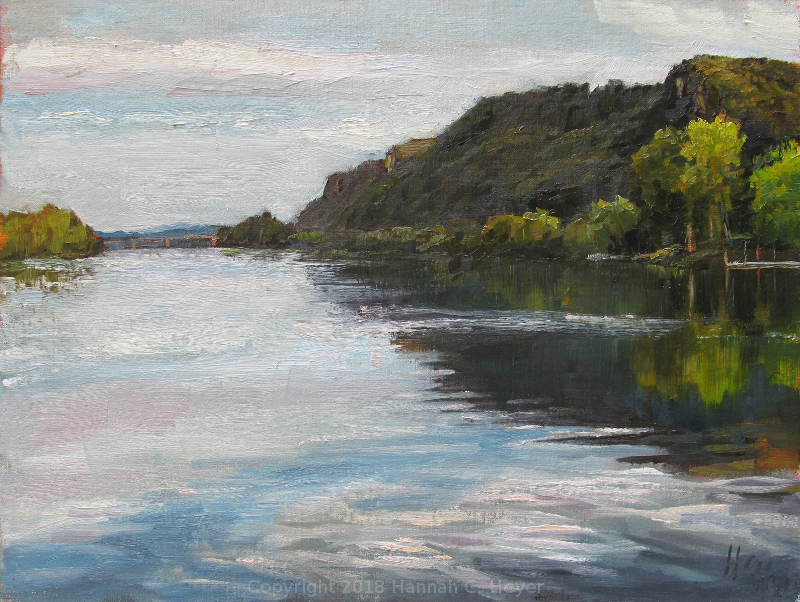 I had my back to the sunset, looking out over Lake Pepin at the softer colors of the sky and the patterns on the water. 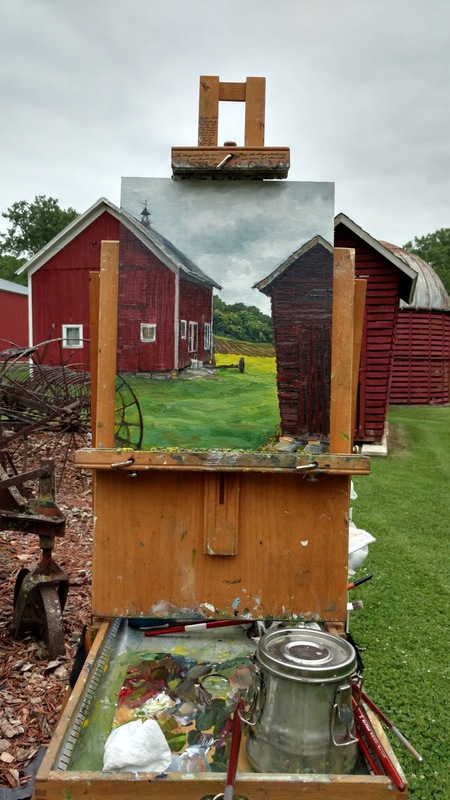 Had a good time painting with Jim Turner, who had found and got permission to paint at this little homestead on the previous day. I spent the humid morning wrestling with roof angles and flat light. Jim's second painting was of me still working on my first! 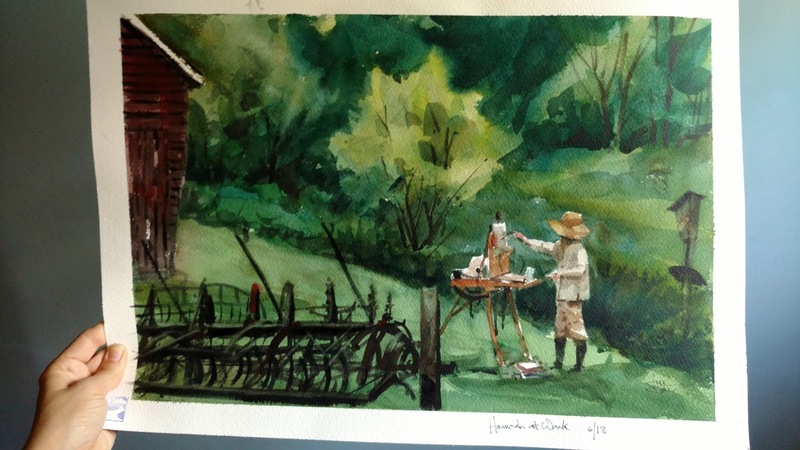 "Hannah at Work", watercolor by Jim Turner. 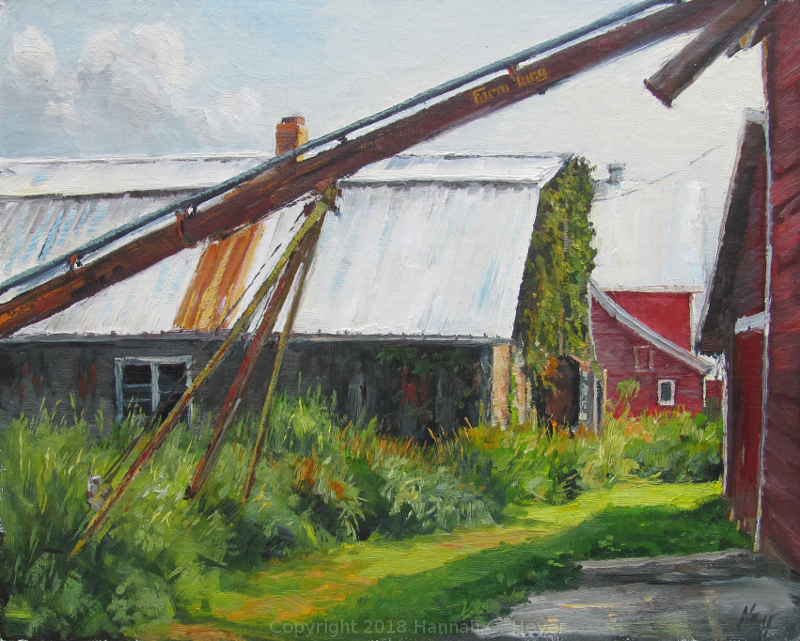 Hill Avenue Farm, 14 x 11" plein air oil on linen/birch. June 12, 2018. In the evening there was a cookout/potluck dinner for the artists and volunteers. I was late, but was glad I showed up. A beautiful location, and some good conversation. 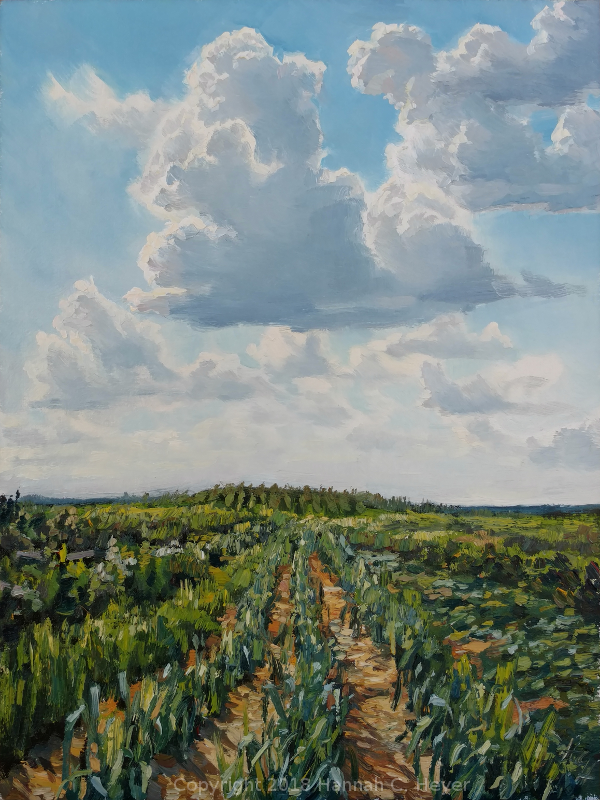 The sky was clearing and the clouds were getting interesting, and on leaving I made a quick decision to head out towards the country and try to capture the clouds in paint. 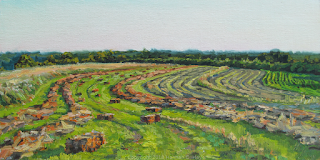 It was a mad dash to paint them before they changed too much and before the light faded! I didn't have quite enough time. I may work on this one again and see if I can fix a few things. 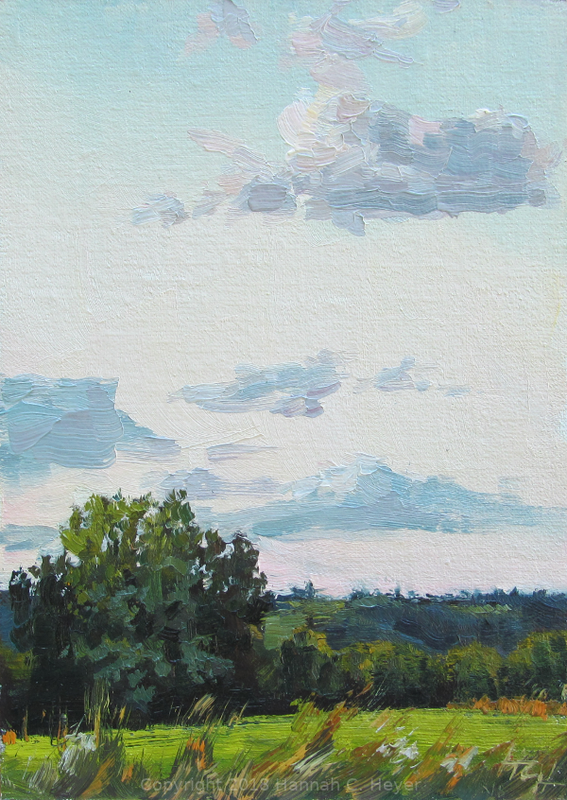 Cloud study, 9 x 12" plein air oil on linen/birch. June 12, 2018. Wednesday, June 13th: Blue sky! I headed back to Frontenac State Park, sat on a picnic table, and painted the early day. "...Weeping may endure for a night, but joy comes in the morning." In years past this plein air week was my time away - a break from caregiving, and a time to focus on painting. During the week I'd call home, checking in to see how my Grandma was doing, worrying, discussing her and her care. At the end of the week I'd return, exhausted. Often I'd be up with her in the night to follow - sometimes it was a battle of wills as I'd try to get her to drink more, or we'd sit together and talk or sing. I'd long for sleep, but give thanks that she was there. I miss her. Still feeling my own loss keenly, I was perhaps extra emotional when it was announced Friday night that my painting "Joy in the Morning" had been selected for the Dan Guida Award. 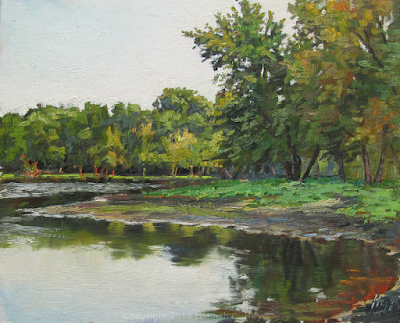 Dan was the longtime director of the Red Wing Arts Association and an enthusiastic force behind this plein air festival. His family created this award in his honor and memory, and I am deeply grateful. 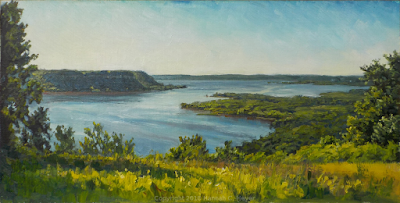 Wednesday evening I returned to one of my favorite places: Rattlesnake Bluff Trail in Wacouta, Minnesota. 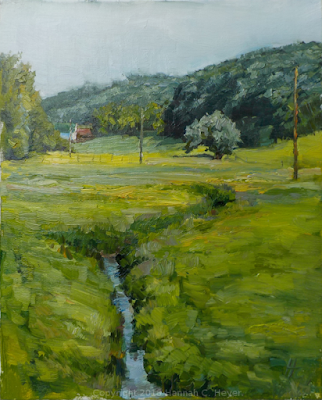 Another study in greens. 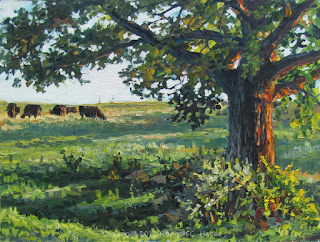 The trees cast shadows across the trail and grass and into the field, and the rocky face of the bluff caught the late afternoon sunshine. 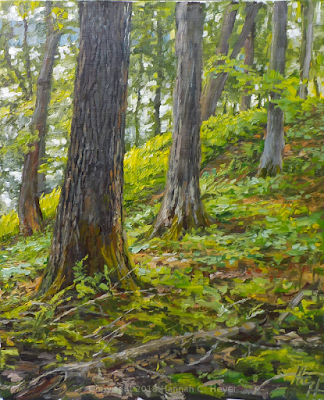 Evening on the Trail, 8 x 16" plein air oil on linen/birch. June 13, 2018. 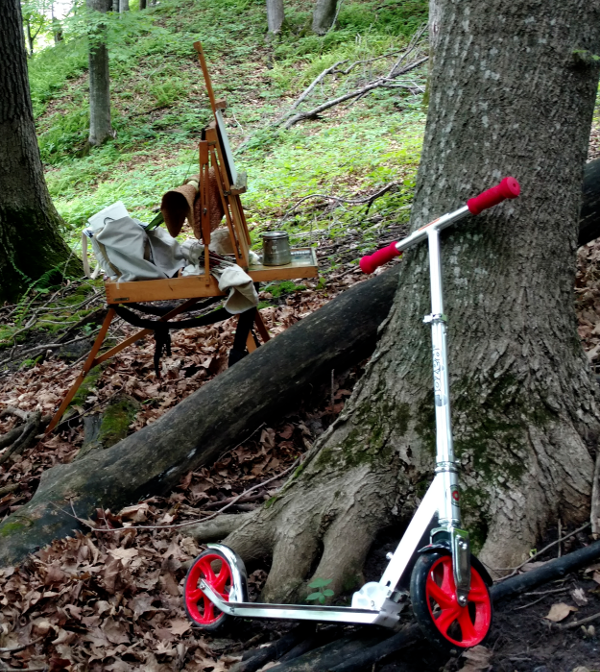 Thursday, June 14th: Back at the park, painting tree portraits. My first painting of the day was again on the Upper Bluff Trail. 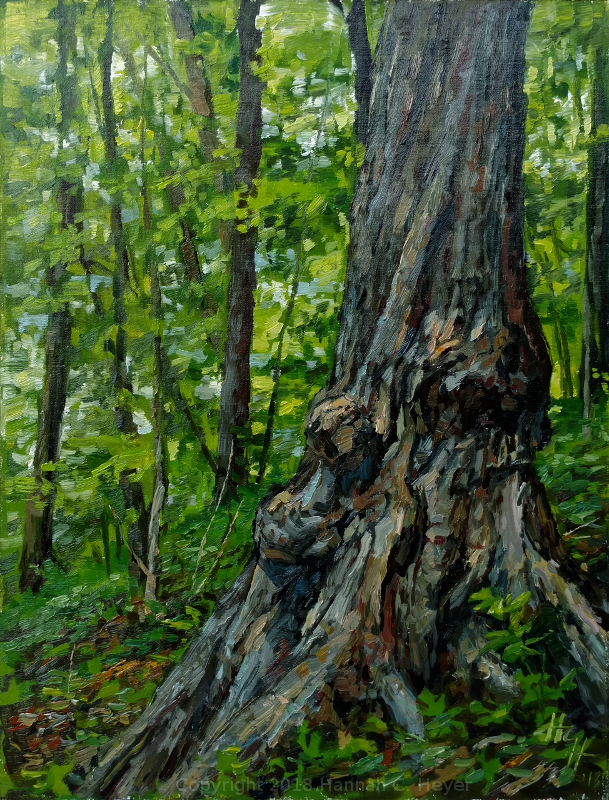 A gnarled maple tree trunk, and the greens of leaves and underbrush. 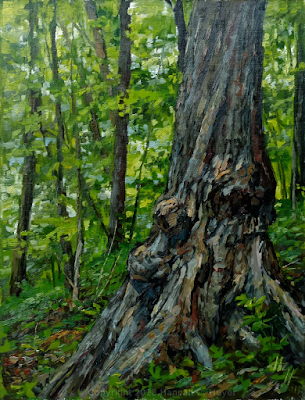 Bluff Trail Maple, 12 x 9" plein air oil on linen/birch. June 14, 2018. My last painting of the day was along the road near the park entrance. I love the shapes of these great trees, and the way they caught the late light before dusk. Standing By, 9 x 12" plein air oil on linen/birch. June 14, 2018. A hot, humid morning. 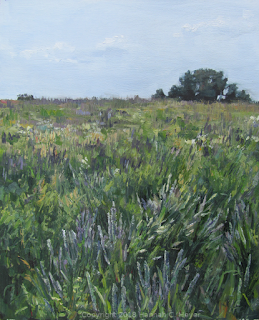 Squeezing in one more painting, before framing and delivering three paintings to the gallery. 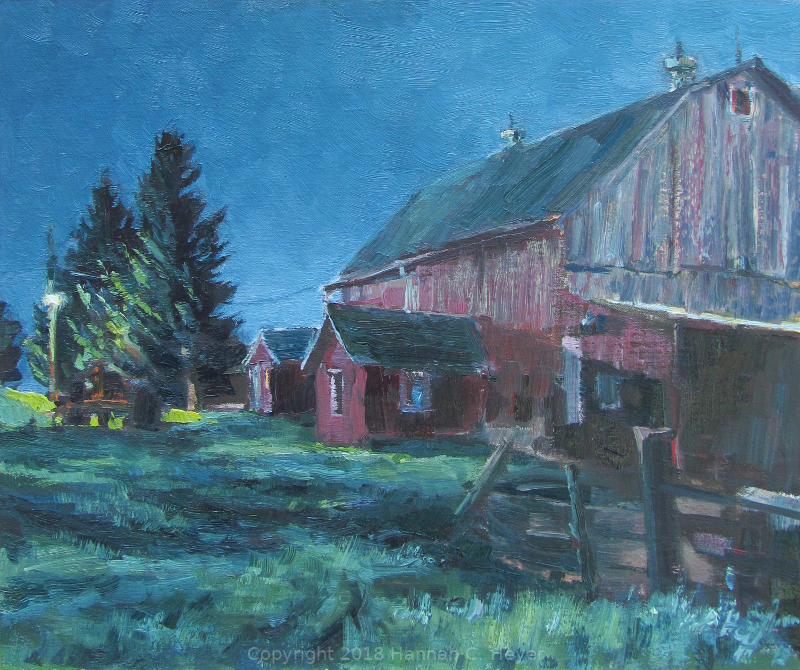 A beautiful little farm off the highway, with rich pastures, colorful cattle, and noisy guinea fowl. More greens. A little creek cutting through the pasture, and a silvery willow tree in the distance. 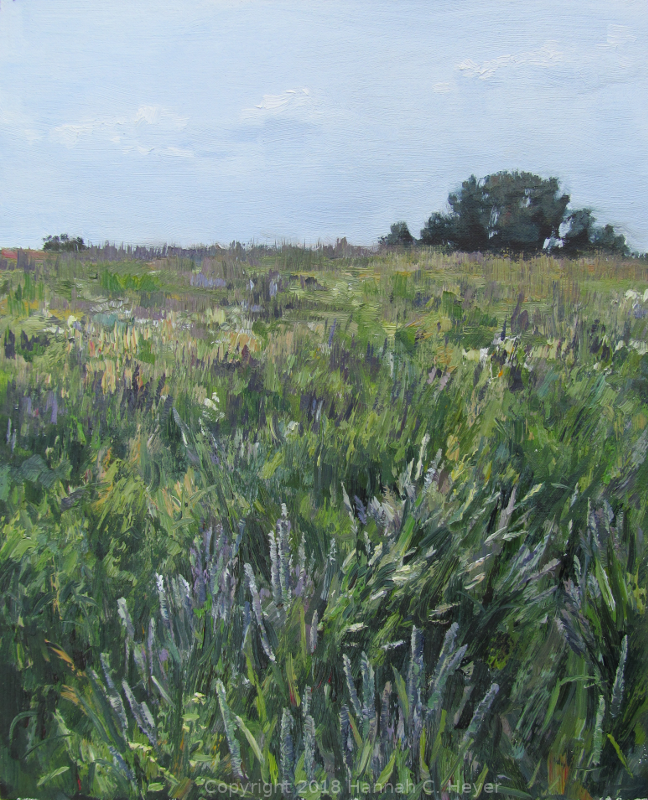 In Pastures Green, 10 x 8" plein air oil on linen/hardboard. June 15, 2018. Friday evening was the special "First Glimpse" and Award Reception, a ticketed event. Judge Lisa Stauffer did a great job of speaking about the art, encouraging notice of and appreciation for technique and portrayal of atmosphere in the works. I was so happy to see Jim Turner receive Best in Show for his painting "Men at work"! 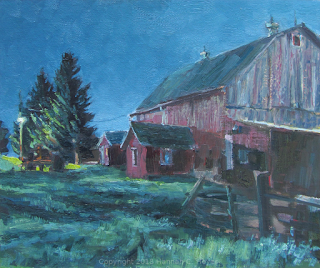 Derek Davis got second place for "Back in the Saddle", and DK Palecek received third place for her painting "Late Sun". 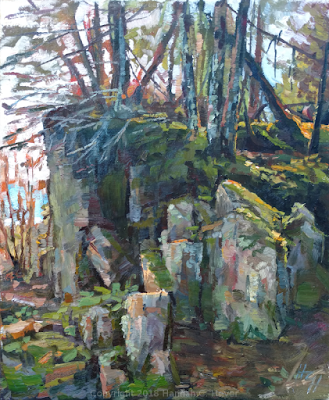 Dan Wiemer's painting "Majestic Maiden Rock" received the "Best Sense of Place" award. I awoke to the sound of thunder and rain. It had lessened somewhat by 9am, when the quick-paint competition started, but an occasional streak of lightning still flashed across the river and every so often I had to put up my umbrella as the rain blew in under the roof of the depot, where a few of us had taken shelter to paint. I did like how the rain changed the view and softened the distant trees. At 11am the horn sounded and it was brushes down! 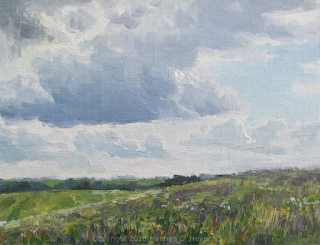 Time to blow off the rain drops that still clung to the painting, and get it framed and into the gallery. Artist Greg Lecker took the award for the quick paint. My four paintings in the show! Now I will admit something here: early in the week, I hurt myself. 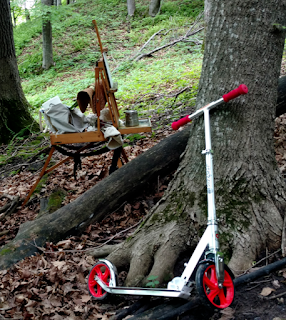 I was zipping along on my scooter, scoping out painting locations (and, really, because it's fun and I'm only a kid pretending to be a grown-up) when we parted ways and I met the pavement. This incident slowed me down; I had to be more careful, couldn't hike far, had to spend more time patching myself up. 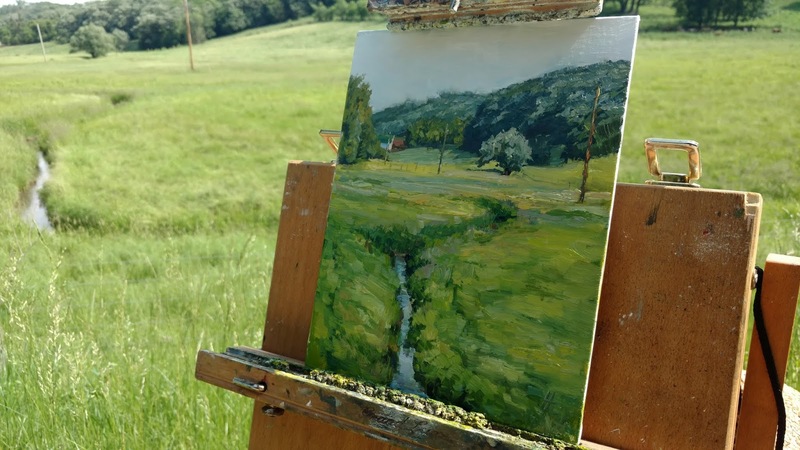 (Yes, guy at Walgreens, I am back for more bandages...) To adapt a famous quote, plein air painting is hard, and it's harder when you're stupid. But my bruises are fading and my new skin is coming in nicely. I still had a great week. Good times with painting friends, and a good dose of time alone. I met some lovely people, a dog who tried to make off with one of my shoes, sunshine and clouds and innumerable shades of green. 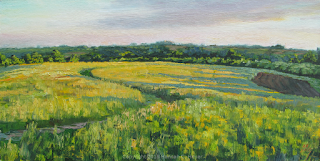 The show will be up till August 5th, and I hope you'll get a chance to stop in at the gallery to see all the work and pick out your own favorites.